Caldwell’s fourth annual Big Event will be held Thursday, April 18, 2019. The Big Event started in 1982 at Texas A&M University as a student-run community service project. During the event, a group of students at A&M gathered together to perform community service projects around the city as a way to say “thank you” to the community for their support of the university and its students. Texas A&M’s event has grown to include over 22,000 students, and it has inspired many other universities across the country to bring the event to their community. It has even gone overseas to include events in Spain, Germany, Italy, and Pakistan! Approximately 250 middle school students and their accompanying staff sponsors will be bused into the community to various locations including local parks and trails, neighborhood community centers, and other designated locations. At those job sites students will be performing safe, student-friendly services such as; picking up trash, cleaning benches and playscapes, sweeping, shoveling, spreading mulch, etc. Any student not involved will experience a normal school day. This event is a great way to enhance the partnership we share between our schools, families, and our community. We have many intelligent, inspiring, hard working students in Caldwell ISD and what better way to showcase their excellence than to create an opportunity for them to give back to the community in which they call home. 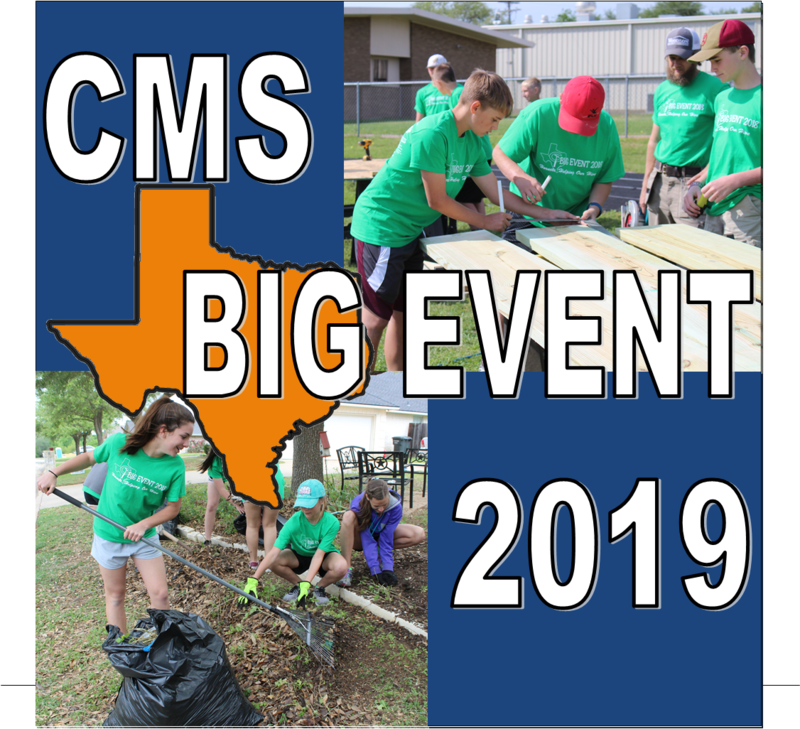 The Big Event will provide the opportunity for CISD students to demonstrate their appreciation for our community through a single day of service and inspire a mindset of lifelong generosity. The Big Event is our students, teachers, staff and district's way of saying "thank you" to the community in which we call home.